Studies of inner speech use in ASD have produced conflicting results. Lidstone et al., J Autism Dev Disord (2009) hypothesised that Cognitive Profile (i.e., discrepancy between non-verbal and verbal abilities) is a predictor of inner speech use amongst children with ASD. 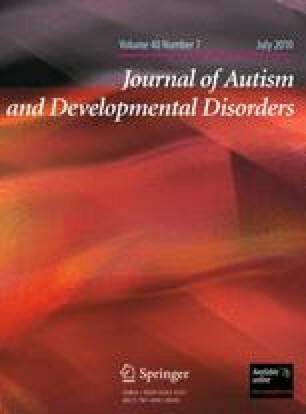 They suggested other, contradictory results might be explained in terms of the different composition of ASD samples (in terms of Cognitive Profile) in each study. To test this, we conducted a new analysis of Williams et al.’s, J Child Psychol Psychiatry 48(1): 51–58 (2008) data on inner speech use in ASD. This revealed verbal ability predicted inner speech use on a short-term memory task over and above Cognitive Profile, but not vice versa. This suggests multiple factors determine whether children with ASD employ verbal mediation. This paper was prepared as part of a City University Research Fellowship, awarded to the first author. We would like to thank Andrew Whitehouse, Jane Lidstone, and Charles Fernyhough for fruitful discussions, as well as for their comments on a draft of this paper.